Anglim’s Western Metal Works is a full-service welding and fabrication shop. We are happy to work with any sort of business throughout the state, including restaurants! Whether you’re looking for custom-designed metal signage or need a prototype design for a new piece of restaurant equipment, we can help. We offer both on-site and in-shop welding and fabrication service, depending on your needs. 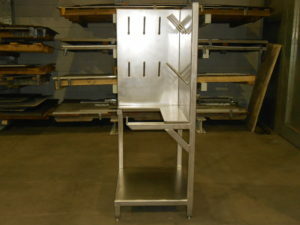 Our welding team is experienced, to work on a variety of materials and techniques. From building pre-fabricated parts for restaurant and micro-breweries to helping you outfit your new restaurant with personalized touches, we have the tools and experience. When you work with a welding company, you want to know that the work you’re getting is of the highest quality. We take pride in the quality of our products ensuring smooth edges, clean seams, and superior structural integrity. You can view some of our completed projects here, to get an idea of our full range of available services. Or, you can contact us today to discuss your needs and receive a quote. Call 505.822.9170 to receive a quote for welding service today.